Winco WDM009-205 Ardesia Linza White Melamine Square Bowl 10"
TigerChef > Dinnerware > Melamine Dinnerware > Melamine Serveware > Melamine Bowls >< Square Bowls > Winco WDM009-205 Ardesia Linza White Melamine Square Bowl 10"
✔ 5 Qt. capacity✔ Color: white✔ Break-resistant, highly durable✔ Dimensions: 10"
$37.57 Winco WDM009-201 Ardesia Linza White Melamine Square Mini Bowl 2-1/2"
$60.57 Winco WDM009-202 Ardesia Linza White Melamine Square Mini Bowl 3-1/2"
$83.00 Winco WDM009-203 Ardesia Linza White Melamine Square Bowl 5"
$103.27 Winco WDM009-204 Ardesia Linza White Melamine Square Bowl 7-1/2"
$37.57 Winco WDM009-301 Ardesia Linza Black Melamine Square Mini Bowl 2-1/2"
$60.57 Winco WDM009-302 Ardesia Linza Black Melamine Square Mini Bowl 3-1/2"
$83.00 Winco WDM009-303 Ardesia Linza Black Melamine Square Bowl 5"
$103.27 Winco WDM009-304 Ardesia Linza Black Melamine Square Bowl 7-1/2"
$90.56 Winco WDM009-305 Ardesia Linza Black Melamine Square Bowl 10"
$29.99 Thunder Group PS3105W Passion White Square Melamine Bowl 24 oz.- 1 doz. $32.99 Thunder Group PS3106RD Passion Red Square Melamine Bowl 20 oz. - 1 doz. $17.99 Thunder Group 1002J Wei Asian Square Melamine Bowl 3-1/8"
$17.99 Thunder Group 1002BB Blue Bamboo Melamine Square Small Bowl 4 oz. 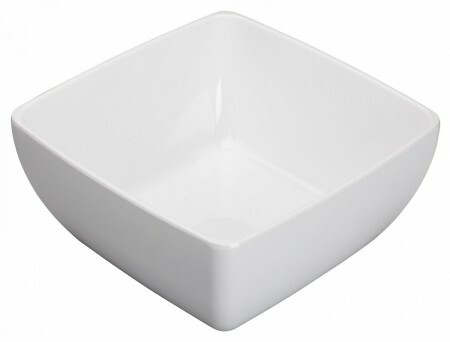 Present your specialty dishes in style with the Winco WDM009-205 Ardesia Linza White Melamine Square Bowl 10". An excellent addition to restaurants and catered events, this square bowl is made from high quality melamine that provides unbeatable durability and long product life. Perfect for both casual and formal settings, this break-resistant item features a smooth surface with a crisp white finish that easily complements any setting and dinnerware collection. This square bowl is an excellent alternative to ceramic dinnerware, perfect for high-volume, commerical use.